Why settle for ordinary when ASAP Tent and Party Rentals delivers extraordinary? Watch for our monthly specials. Over the winter season of 2014/2015 ASAP Tent and Party Rentals will be doing something we have never done before! Monthly specials usually featuring some of the new products that we have added this fall will be ongoing. Rent a chair and a chair cover for less than some companies charge just for the chair cover alone! So many party rentals in Toronto and the GTA are delivering pretty humdrum stuff and charging premium prices. 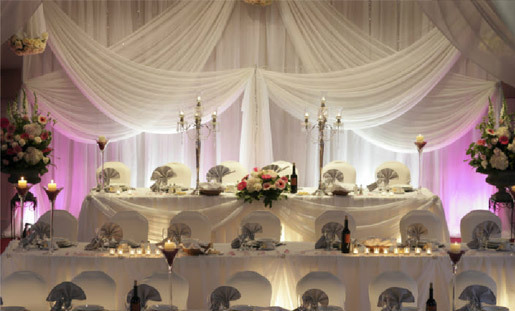 Break out of the ordinary and get linens that your guests will be talking about long after your event is over. ASAP Tent and Party Rentals has all the latest specialty linens Want the new crushes and satins and at prices that some places are charging for plain whites. New for 2014 ASAP Tent and Party Rentals is offering a complete wedding decor package that includes a spectacular backdrop, head table, cake table and receiving line for one low unbeatable price. New for 2015, An Event Lounge as an addition to your tent. This special package includes a 15 X 15 tent added as an extension to your existing tent, a black and white drape theme, an internally illuminated acrylic bar, a special lighting package, a white sofa and a white table. This package price when ordered with a regular wedding tent is only $1499.99. ASAP Tent and Party rentals has been in business since 1989 and has done more weddings than some companies will ever do. We have been around a long time and continue to strive to be the best available at any price however the best does not mean the cost need be more. We are always looking for new and fresh approaches at doing things so it will not be same old same old. We carry the newest and latest in many categories and continue to add new products that are more than just a passing fad. November Chair Covers and a folding chair for less than most companies charge for just a cover or just a chair alone. December 120 inch diameter white tablecloths for only $8.00 each. Some event rental companies charge up to $18.00 each. January Order 100 linen napkins and get a personal visit and a lesson on napkin folding. Learn how to do 3 different napkin folds, Bird of Paradise, The Bishops Mitre and the very elegant “The Crown”. Brampton we will deduct $30.00 from the regular delivery prices. March 90″ diameter tablecloths for only $5.oo each. April Check back or become a member to find out what the super special for April will be. You can be e-mailed the posts and specials on this web site. Become a member and you can comment and be e-mailed updates and specials as they are posted. This entry was posted in Party Rentals and tagged ASAP Tent & Party Rentals, backdrops, Greater Toronto Area, linens, rental, table linens, Toronto. Bookmark the permalink.